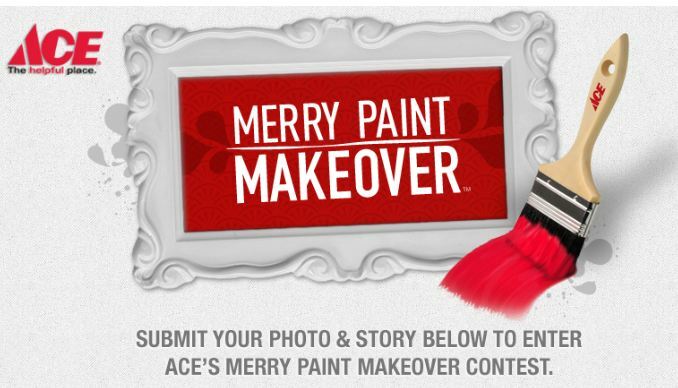 Ace Hardware $50 GC Giveaway and the Merry Paint Makeover Contest! 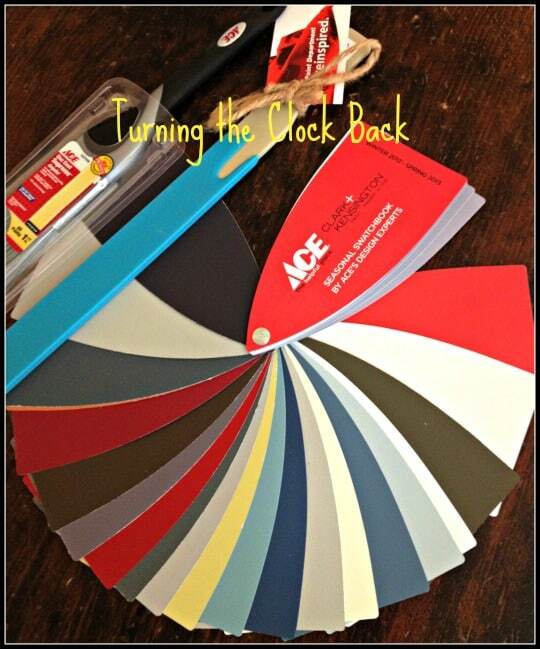 Home » giveaway » Ace Hardware $50 GC Giveaway and the Merry Paint Makeover Contest! My husband and I are one of those odd couples that actually enjoys browsing through hardware stores. One day when the kids were young and we had a rare afternoon free we actually used our kid-free hours on a trip to Ace Hardware! Odd, yes but we like planning ways to improve our home and doing things yourselves is much cheaper than hiring someone to do it! We try to avoid those HUGE hardware stores because we feel that our local Ace Hardware gives us much more personal service. Their employees know what they are talking about and can really explain all the ins and outs of a particular project. Even something as simple as a drain snake! Well, Ace Hardware wants to help YOU make over your home this winter with their Merry Paint Makeover Contest! I bet just about everyone has a room in their house that could use a coat of paint. I know our hallway walls are streaked with dirty kid fingerprints and the plain shade of eggshell in the playroom does NOT inspire feelings of playfulness! Well, the Ace Hardware Merry Paint Makeover Contest is the perfect way to jazz up your home with a splash of color for the holidays! You must submit a photo and a 100-word description of a room in your home to enter. The contest will conclude on November 26 and winners will be announced early December for projects to be completed just in time for the holidays! I got the chance to check out the new Ace Hardware Paint Color selection and they have some great colors to choose from. I would go with a mellow shade with pops of bright color for the playroom. It would be a HUGE improvement over the bland white that is in there now…especially since I could finally get rid of all the fingerprints! Enter the Ace Hardware Merry Paint Makeover Contest from November 14 to November 26 at 12:00 p.m. EST and see whose room needs the biggest makeover. WIN a $50 Ace Hardware Gift Card! Ace Hardware would like to provide one of my readers with a $50 Ace Hardware gift card to spruce up your own home this holiday season! This is a Rafflecopter giveaway so follow the directions in the form to enter. This contest will end at midnight EST on November 30th, 2012. Disclaimer: In accordance with the Federal Trade Commission’s 16 CFR, Part 255: “Guides Concerning the Use of Endorsements and Testimonials.”: I received promotional items in exchange for providing this information. I'd like to repaint the living area in a warm cozy harvest gold! A dusty green -- kind of olive. I would love a nice beige--boring, I know--but right now it's yellow and I hate it! Cream with dark red trim which is exactly what we're painting it right now. either a tranquil blue color or dusty rose. I'd love to repaint in a nice shade of robin's egg blue. A soft gray that has a warm purple hint... plus some nice white crown molding! I would choose a medium gray. I'd choose to paint it a bright kelly green! Seriously. I think it would look spectacular! I would choose some shade of beige or grey. My favorite living room color is the color it is now: black and white with a splash of red! We just pained our great room in "Impressive Ivory" a Sherwin Williams color. I like it since it's neutral for such a large area. plum would be a nice color. I would love to paint it a soft grey. I just painted my living room honey milk which is a warm white and works really well on my wonky cottage walls so if i could have it any color...honey milk is perfect. I would like my living room to be painted white with one earth toned accent wall. I have a small cottage, so I love the simplicity of white. I am loving gray right now! It is a dark plum now, I would probably choose the same color but lighter in shade. An off white a little darker than it is now, maybe a light brown or tan. I would choose beige. It's my favorite color! Mine is the color that I always wanted. It's black and dark red. Gothic looking! Ruby red! But that would be most of the main floor since we don't have any dividing walls, so it's a mellow gold for now! I think I would pick a light blue. I'd pick a dark gray or rustic red, something dramatic! I have a HUGE living room with really high ceilings so I'd really love to try something bold. It'd be a chocolatey brown! Like the softest blue you can find, something that looks like the ocean. Actually, scratch that, I'd paint my entire living room to look like the ocean. What do you think? We like bold colors, so maybe red or green! Light gray with white trim. I'd like a light red...i think that would be nice. With our current living room....when we finally paint it to not look like the 70's anymore..hmm. One orange accent wall, the rest pure white or an ivory (wood panelling seems to only look decent painted white or off white colors). I'd love it to be red. I would like 3 walls a light beige with a blue green accent wall. Thank you. Facebook took away my like of the Ace page - please delete my entry for that option. Sorry. Apparently they have limited my account. I would choose beige because you can match anything around beige. I'd paint my living room a pastel green or purple. I'm torn between a few warm colors- a warm white, warm grey or warm blue, maybe! I love my living room as it is - a soft and airy green. I would paint it navy and grey - accent walls for a cool finish. I would paint it a light cocoa, beige color. I would choose a soft blue!